The central focus of communication study at Michigan State University is the description and scientific analysis of how human beings create, transmit, receive and respond to messages. Unlike disciplines, which only look at one part of this process, we seek to integrate our understanding of how these various elements relate to form the entire process of human communication. The Department of Communication has for 50 years set the standard (consistently ranking in the top three departments nationally) by which departments of communication elsewhere judge their curriculum, their faculty, their students and their scholarly productivity. Our plan for the next decade is to retain a leading role in higher education in communication research, teaching and societal relevance. In 1957, the Department of General Communication Arts was the first new department created in the College of Communication Arts and Sciences at Michigan State University, joining the pre-existing School of Journalism and Department of Speech. Gordon Sabine, then dean of the new college founded in 1955, served as interim chair of this new unit. The new unit changed its name to the Department of Communication in 1962. The operational beginnings of the department included the partial services of one faculty member and the partial services of a secretary. The total budget was $7,000. In 1958, the department enrolled six graduate students, one of whom had an assistantship. There was no undergraduate major, no undergraduate students and no curriculum. There were no precedents in 1957 for this type of department because there were no other communication departments in higher education at that time that sought to be what the faculty here wanted to try as an institutional experiment: A social science, empirical research department that would focus on theory and research about communication processes and outcomes. The idea was that there may be generalizable truths about communication phenomena that, at least to a degree, held across different contexts, such as in interpersonal relationships, organizational settings and mass communication, and that those general tendencies could be observed and learned from for building a science of communication. The intellectual leader and its first full-time chairperson was David K. Berlo, a new Ph.D. from the University of Illinois. His leadership, from 1960 until 1971, engendered the development of this program at MSU and through the progeny of the department, throughout the world. When Dr. Berlo left MSU, it was to become President of Illinois State University. But for its first five years, the department had a simpler, more modest goal: to exist. It did so by acquiring young faculty with high potential such as Hideya Kumata, Erwin Bettinghaus, Verling “Pete” Troldahl, Jack Bain, Mal MacLean, Paul Deutschmann and Gerald Miller, among others, by creating undergraduate service courses for students in other majors (COM 100) and an undergraduate major. In addition, the department began a 20-year association with what would become the United States Agency for International Development (USAID); the faculty designed and conducted hundreds of communication training seminars for foreign participants in U.S. technical assistance programs. Initial efforts also were directed at establishing an interdisciplinary Ph.D. program. Quickly, the department was establishing itself as a visible contributor to Michigan State's proud Land Grant mandate as the nation’s first Land Grant College. From its beginning, the department sought to examine symbolic behavior in all its forms - verbal and nonverbal, interpersonal and mass, small groups and large organizations, intra-cultural and cross-cultural. Coursework developed for undergraduates was matched with parallel courses for graduate students, with a consistent emphasis on a quantitative, behavioral science approach to research questions. This was never a “skills department” per se, rather, graduates were to have mastery of communication concepts that they could then deploy across a range of as of yet unanticipated behavioral contexts, as the work demanded. Technology would continue to change and die, but mastery of conceptual knowledge, both basic and applied, would not. The faculty mentored the graduate students, and the graduate students mentored each other. Occasionally, the graduate students mentored the faculty. The department established a unique, high-touch approach to doctoral education in which every Ph.D. student was apprenticed to a faculty member or two, and students and faculty worked hand in hand in teams. That practice strongly continues today. By 1968, one decade after its onset, the Department of Communication had graduated 60 Ph.D.s in communication and began to stock the faculties of other universities across the U.S. and the world. Large new cohorts of doctoral students entered the department. By the late 60s, the department could lay claim to 250 majors, state support of $400,000 and research grants totaling $200,000. Then, all the faculty and student majors from the Speech component of the Department of Speech and Theatre were transferred into the Department of Communication, increasing the faculty by 50% and the student majors four-fold. The communication department also was branching out internationally, with diffusion of innovation projects led by Emerett M. Rogers in Brazil, India, Costa Rica, Nigeria and Peru, as well as major funding from federal agencies to study contemporary communication issues, e.g., decision-making in jury trials, violence on television, advertising effects on children and communication among the urban poor. To better see the scope of ongoing changes and growth, by 1978, now 20 years into its existence, class enrollments had grown from fewer than 300 to more than 800, and undergraduate majors from 60 to nearly 500. From a handful of graduate students, there were now more than 100. And the department now had its first two female faculty members. The communication department has had dozens of young faculty who launched very impressive careers here: Don Cushman, Don Ellis, Judee Burgoon, Steve Wilson, Joe Woefel, Kathy Kellerman, Stacy Smith and Ed Fink - to name a few. They were individuals trained elsewhere who contributed strongly to the dynamic of change and evolution in the department. Throughout these decades of change and growth and identity formation, the department has had a rock steady group of 'den mothers' - Shirley Sherman, Barbara Haslem and Ann Wooten - who functioned as department secretaries for periods longer than the chairs with whom they worked. This wonderful tradition of long service to the department by expert staff continues today with Marge Barkman and Debra (Tigner) Waters who have each committed decades of their expertise to the department. Communication department leadership has emerged consistently from among its own ranks. The first chair, David Berlo, was succeeded by an interim chair, Jack Bain, who had recently resigned as the College's Dean. Erwin Bettinghaus served as chair from 1972-1976 (subsequently serving as the Dean of ComArtSci for 26 years), Bradley Greenberg (1977-1984), Gerald Miller (1985-92), David Johnson (1992-1997), Charles Atkin (1997- 2012) and now James Dearing (2013-present). All these chairs began their academic careers at MSU as assistant professors, save Dr. Johnson, who received his Ph.D. from the MSU program and later returned to its faculty. Atkin, Miller and Greenberg all received MSU's highest research accolade as University Distinguished Professors. We live in an era of immense social and technological challenge. We face the information and social media revolution, which, like the industrial revolution of the past century, is fundamentally reshaping major aspects of our global society. We witness increased ethnic conflict, major corporate restructuring, and increased health problems, particularly among youth at risk. Communication is central to confronting these challenges. How can we communicate to manage conflict, improve information flow, or persuade at-risk youth to engage in healthier behaviors? How can we help our aging population to live fulfilling lives in their later years? Through our interaction with practitioners, students, community members, federal agency leaders and research colleagues we apply communication principles to these challenges. The Department of Communication has for 35 years set the standard (consistently ranking in the top three departments nationally) by which departments of communication elsewhere judge their curriculum, their faculty, their students and their scholarly productivity. It was created in the innovative context of the first major College of Communication and it has maintained its innovative stance in recent years. Our plan for the next decade is to retain the lead role in higher education in communication. Our teaching efforts will focus on communication theory and research with the goal of providing students with knowledge and skills sufficient to empower them to confront the important communication problems inherent in key social issues. Our research efforts will focus on developing a rigorous, reliable body of knowledge about human communication. Faculty and students have been leaders in developing theoretical frameworks, which have guided the work of numerous scholars in the discipline. While we focus on teaching, research and outreach, they are not separate activities. Rather, they reflect the department's commitment to a set of core values related to curiosity, craft, centrality and commonwealth. The Department of Communication will debut a new undergraduate curriculum in Fall 2017. 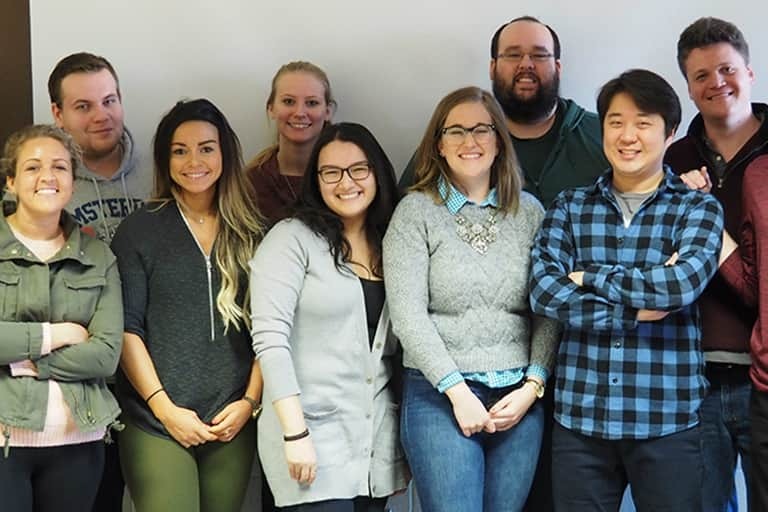 The department will participate in the new college-wide online master’s program in strategic communication and debut a new research lab called the CARISMA (Center for Avatar Research and Immersive Social Media Applications) Lab.